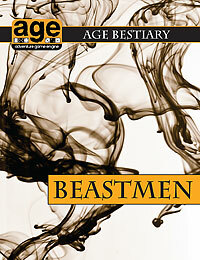 Today we present a new product for the AGE System (the rules that power the Dragon Age RPG): Beastmen! Strange mixtures of animal and beast, the idea of the bestial humanoid who combines human cunning and animal ferocity can be found in numerous cultures and entertainment media. From heroic half-animal men to hungry tribes of man killing beasts, they can be a serious threat or unusual ally to many adventurers. Includes cute and furry and dangerous beastmen, centaurs, fish men, minotaurs, and reptile men, and rules for cursed and tribal beastmen.